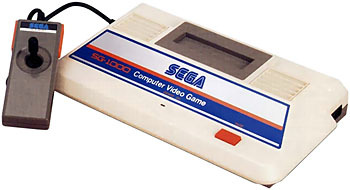 The SG-1000 (also called the Mark I) was Sega's first home console. Although a market test was conducted in 1981, it would be another two years until the SG-1000 received it's full launch, putting it in direct competition with the NES. Sega's arcade background meant that a number of arcade games were converted to the system, most of which were very well done. The graphics and sound may seem primitive today, but this was cutting edge technology back then and the games are still quite playable even now. While Sega marketed the console in Asia, Grandstand took care of overseas sales. The console was available in a number of countries and was popular not only in Japan but also New Zealand and Taiwan, but for some reason it was never released in America. A number of clones of this system were available such as the Othello Multivision and the DINA 2-in-1/Telegames Personal Arcade, which was advertised as a ColecoVision clone but it could also play SG-1000 games, a fact which most owners were unaware of! The SG-1000 was followed by the SG-1000 Mark II, which was released in 1984.
see more Sega SG-1000 Ebay auctions !